The Green Girl loves to travel. From the time I was a small Green Girl, I've enjoyed visiting new places and experiencing different cultures. Along the way, I picked up quite a few tips and tricks. And after a lot of trial and error, I learned to streamline my packing process. Family and friends often come to me for travel and packing advice. Quite a few people have mentioned they actually reference my packing lists to make sure they didn't overlook anything. I've decided I will consolidate my travel knowledge into a series of blog posts. I will start with travel wardrobe choices and carry ons. When traveling to a destination, my main priorities are comfort and security. I would suggest always layering your clothing because airports tend to be cold but airplane temperatures can fluctuate. But also keep in mind when you go through airport security, you must remove all jackets, sweaters, or other heavy articles of clothing. If you only have a skimpy tank top on under a zipped jacket, be advised you will be forced to remove that outer layer. If you are traveling during the cold winter months, wear your bulkiest clothing so it doesn't take up so much space in your luggage. Purchase a metal-less belt like the Eagle Creek All Terrain Money Belt so you don't have to remove it when you go through airport security. This belt can also be used to store extra money. You can easily store at least ten folded bills in the zipped section. Wear comfortable shoes that can be easily slipped on and off. Keep in mind if you don't wear socks, you will have to walk barefoot through security. In terms of carry ons, I highly recommend taking a backpack and a cross shoulder strap bag. I believe this combination is best because you are distributing the weight across your body. The cross strap bag can be smaller or larger - depending on your needs. 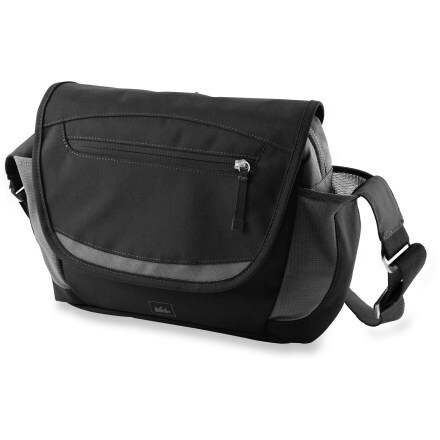 My bag of choice is the REI Chock small messenger bag. It's just the right size to fit everything I need when I travel. I love how it features slots in the front and back - my Camelbak Better Bottle .5L fits perfectly and I can stash a travel umbrella in the back. And most importantly, it zips shut so nothing will fall out if you accidentally drop your bag - this is very important when traveling. Store your passport and travel documents in the bag that is crossed over your body to keep them secure yet easily accessible. It's much harder to keep a close eye on the contents of your backpack. Store some money in that bag for incidentals but keep the majority of your money somewhere more secure. If I am traveling abroad, I will have some money in my Eagle Creek belt, some in a zip bag in my hidden money belt under my pants, and a small amount each day in my bag. I carry a North Face Recon in Truckee Green. I love how it has both chest and waist straps. I cannot say enough good things about the Eagle Creek inflatable neck pillow. It inflates with three breaths and deflates in a couple of seconds. The cover is machine washable and you can dry it as well. In addition to the plane, I also use it at to take naps at the airport, on trains, on buses, you name it and I've probably napped there. All Eagle Creek products carry a lifetime guarantee so if you do manage to pop your neck pillow, they will gladly send you a replacement free of charge. Truth be told, I had my neck pillow replaced a few times before they reengineered it. I've had this one for over five years now. I always tell people to bring all chargers for all electronics in the carry on because if your flight is delayed, you are going to want to keep your mobile devices charged. You will also want things to help pass the time. In terms of the reusable water bottle, I just empty the bottle at the curb when I arrive at the airport and then once I'm past security, I go to the nearest food concession stand and ask for a free cup of ice water. For freshening up at the end of a long flight, I highly recommend Giovanni Recharge Organic Peppermint Towelettes. They are conveniently individually wrapped and the mint is refreshing and renewing when a shower isn't available. I recommend trying to keep these bags as light as possible because there may be times when you have to sprint significant distances through a crowded airport to catch a connecting flight. Aw, I'm so glad this will be helpful for you, girl. When are you packing for Greece already? Another is call the airline early to upgrade to a bulkhead or emergency exit seat - lots of leg room! Ewa, I'll start packing next month. I have family coming to visit end of this month so I don't have to have my bags out and in the way. Andrew, I'm only 4' 10.5" so leg room is never an issue for me! Ahhh, REI - love that store. I used to work there many eons ago and really miss that awesome discount. I love your helpful hints - reminds me when I went to Boston and I crammed 4 days of stuff into one carry on and some of my Cali roomies had like 5 pairs of shoes - hehe. Thanks, greenie. Now I just wish I had funds to travel :(.